TLAHUELILPAN, Mexico (Reuters) - A blast at a gasoline pipeline in Mexico that killed at least 79 people has put renewed attention on the government's strategy to stop fuel theft, with some relatives saying fuel shortages stemming from the plan led victims to risk their lives. Fuel thieves punctured the Tula-Tuxpan pipeline a few miles from one of Mexico's main refineries on Friday. Up to 800 people flocked to fill plastic containers from the 7-meter (23-ft) gasoline geyser that ensued, officials say. A couple of hours later, it erupted in flames in a powerful explosion. 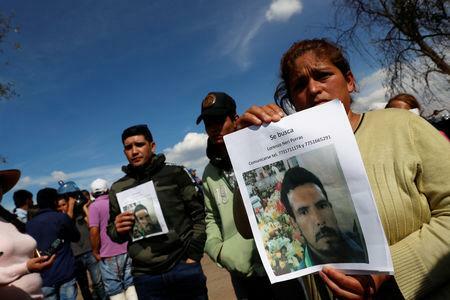 "A lot of innocent people came here, perhaps their car didn't have enough gasoline for tomorrow, and they said I'm just going to go for a few liters," said farmer Isidoro Velasco, 51, who was waiting for news of his nephew Mario Hidalgo, who he believed was likely killed. Hidalgo would have turned 34 on Saturday. "I won't take a single step backwards," he told a press conference. "I can only offer people apologies, if this action causes sacrifices, harm and inconveniences. But we have to do it." He said he hoped supply would normalize next week, as Mexico buys more tanker trucks for distribution by road. Most gas stations in Tlahuelilpan were operating normally on Sunday, after being closed on Saturday. Pemex closed a valve at the pipeline after noting a drop in pressure from the leak, Pemex Chief Executive Officer Octavio Romero said at a press conference on Saturday. Pemex was aware of the leak at 1650 local time, but did not say at what time the valve was shut, he added. Lopez Obrador said prosecutors will investigate, but that even if the valve were closed immediately there still would have been 10,000 barrels of high octane gasoline in the section of pipeline between the Tula refinery and the village. The defense ministry and Lopez Obrador said the army, which had just 25 soldiers present, did not want to hold back the crowd. Critics say authorities should have called for reinforcements and been firmer in sealing the area. Lopez Obrador said the soldiers told villagers not to get close, but that they were ignored. Romero said the pipeline had been out of service since late December while the government tried to secure it from gangs who had hit it 10 times in Tlahuelilpan. Since the pipeline was reopened on Jan. 16, he said, it has been hit four times.